I am trying to mount Surveillance Radar 2 on my Edinburgh. 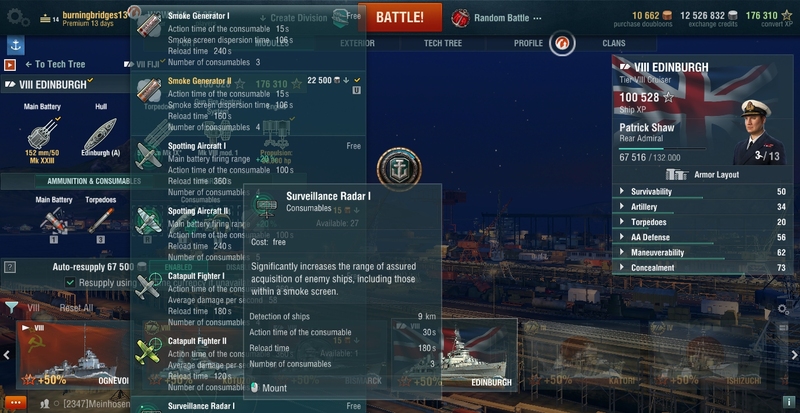 The consumable list is too long (Smoke, Fighter, Scout, Radar) and I can only see (barely) Surveillance Radar 1. I do not have the option to scroll down below Radar 1. I think you can click and drag up on the menu to scroll. It's a UI thing, and I hope they fix it soon. Just curious what resolution is that ? I'm guessing a laptop or a really old monitor? An older Toshiba Satellite C55-A. Same problem on the same ship. Radar 2 is unmountable.